SEABROOK, N.H. (AP) — The cod isn’t just a fish to David Goethel. It’s his identity, his ticket to middle-class life, his link to a historic industry. “I paid for my education, my wife’s education, my house, my kids’ education; my slice of America was paid for on cod,” said Goethel, a 30-year veteran of these waters that once teemed with New England’s signature fish. But on this chilly, windy Saturday in April, after 12 hours out in the Gulf of Maine, he has caught exactly two cod, and he feels far removed from the 1990s, when he could catch 2,000 pounds in a day. His boat, the Ellen Diane, a 44-foot fishing trawler named for his wife, is the only vessel pulling into the Yankee Fishermen’s Co-op in Seabrook. Fifteen years ago, there might have been a half-dozen. He is carrying crates of silver hake, skates and flounder — all worth less than cod. One of America’s oldest commercial industries, fishing along the coast of the Northeast still employs hundreds. But every month that goes by, those numbers fall. After centuries of weathering overfishing, pollution, foreign competition and increasing government regulation, the latest challenge is the one that’s doing them in: climate change. Though no waters are immune to the ravages of climate change, the Gulf of Maine, a dent in the coastline from Cape Cod to Nova Scotia, best illustrates the problem. The gulf, where fishermen have for centuries sought lobster, cod and other species that thrived in its cold waters, is now warming faster than 99 percent of the world’s oceans, scientists have said. The warming waters, in the gulf and elsewhere, have caused other valuable species, such as clams, to migrate to deeper or more northern waters. Others, such as lobsters, have largely abandoned the once-lucrative waters off the southern New England states of Connecticut and Rhode Island, having become more susceptible to disease or predators. Lobster catches in Maine are booming as the species creeps northward, but as the warming continues, that’s a good thing bound to end. A federal report from 2009 said that half of 36 fish stocks studied in the northwest Atlantic Ocean have been shifting northward over the past 40 years, and that the trend is likely to continue. Fish aren’t the only ones moving on, and not just in the Northeast. The U.S. fishing fleet has dwindled from more than 120,000 vessels in 1996 to about 75,000 today, the Coast Guard says. For the fishermen of the northeastern U.S. — not all of whom accept the scientific consensus on climate change, and many of whom bristle at government regulations stemming from it — whether to stick with fishing, adapt to the changing ocean or leave the business is a constant worry. Robert Bradfield was one of the East Coast’s most endangered species, a Rhode Island lobsterman, until he pulled his traps out of the water for the last time about a decade ago. Bradfield, of Newport, started in the fishery in the mid-1970s and stayed in it for some 30 years, sometimes catching 2,000 pounds of lobster a day. During his final years, he was lucky if he caught 100 pounds, not even enough to pay for bait, fuel and deckhands. He now works on a pilot boat, guiding larger ships in and out of the harbor. He is glad he’s still on the water, but he misses lobstering and the community of fishermen he used to see in Newport. The number of adult lobsters in New England south of Cape Cod slid to about 10 million in 2013, according to a report issued last year by an interstate regulatory board. It was about 50 million in the late 1990s. The lobster catch in the region sank to about 3.3 million pounds in 2013, from a peak of about 22 million in 1997. Bradfield’s take on the role of warming oceans is nuanced and reflects the many years he spent on the water. Shell disease, he said, has taken a toll on southern New England’s lobster stock, something scientists say is a result of rising temperatures. Bradfield also agrees with scientists who say the increase in predatory fish, such as black sea bass, is bad for the lobster population. Warming oceans are responsible for the increase in those fish species off New England, scientists say. But Bradfield, a father to three grown children, also said his decision to leave the fishery was more about economics than science. He thinks some published studies are inconsistent. And he laments that Newport’s docks, once home to dozens of lobster boats, are now down to a few. “It tore me up to do something else,” he said. Others in the lobster business dispute the science that lays the blame on climate change. Nicholas Crismale, a former lobsterman and president of the Connecticut Commercial Lobstermen’s Association, is one of many lobstermen in his state who believes pesticide runoff is to blame. Connecticut researchers found no pesticides in lobsters collected in Long Island Sound in late 2014. But Crismale, out of the business for four years and helping to run his wife’s restaurant, Lobster Shack in Branford, sticks to the hypothesis, even in the face of science. Crismale said it’s a shame that lobstering, often a multigenerational enterprise in New England, is reaching its end in Connecticut. He used to bring his daughters out fishing with him, but they’ve grown up to be a lawyer and a teacher, and another generation isn’t taking their place. Connecticut’s lobster fishery, based on Long Island Sound, has been hit especially hard by warming water and has been reduced to nearly nothing. A power plant on the sound recorded more than 75 days with an average water temperature above 68 degrees Fahrenheit in each of the years 2012, 2013 and 2014, according to a regulatory board’s report. Between 1976 and 2010, that happened only twice. Lobsters prefer temperatures in the high 50s and low 60s. There were nearly 300 lobstermen in Connecticut in 1999, and now there are maybe a dozen full-timers left. Some in the Rhode Island lobster fishery said it’s still possible to make a living in the business. Greg Mataronas, the president of the Rhode Island Lobstermen’s Association, who fishes out of Little Compton, said regulations and territoriality prevent members of the state’s fleet from moving to more fertile grounds. But the few remaining lobstermen in Rhode Island are still able to pull lobsters from the state’s waters, he said. “There’s a real disconnect between what the guys are seeing on the water and what the scientists are saying,” he said. Bradfield isn’t buying it. He is glad he left the business, as painful as it was to leave a piece of his identity behind. David Goethel has spent most of his life fishing for New England cod, and he doesn’t want to stop now. Fishing is in Goethel’s blood. He paid his way through Boston University by taking thrill-seekers out on “party boat” fishing trips in Boston Harbor and segued into commercial cod fishing in 1982. Today, he operates a trawler that leaves from New Hampshire, its nets scouring the Gulf of Maine for fish. But the catch these days is different — with the cod in jeopardy and quotas that limit his ability to catch them at all-time lows, cod fishermen like Goethel try to eke out a living by supplementing cod with just about anything else they can catch. Goethel is making much less money. In the 1980s and ’90s, he could bring in $120,000 in a year, but is now making about $60,000, without subtracting a health insurance bill over $27,000. He and his wife, who is up every day at 4 a.m. for a far-flung teaching job, haven’t taken a vacation in three years. Retirement isn’t in the cards for the 62-year-old Goethel — at least, not soon. 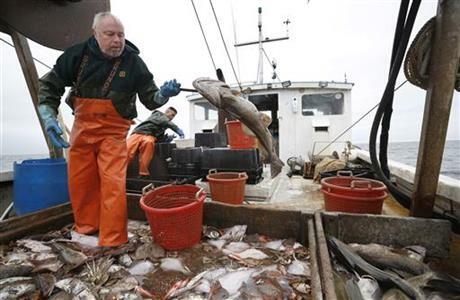 The challenges climate change have brought to commercial fishing are perhaps most noticeable in New England’s cod fishery, which has dwindled from more than 1,200 boats in the 1980s to only a few dozen today. In that time, the catch of cod has also plummeted, from more than 117 million pounds in 1980 to just over 5 million in 2014. Most consumers haven’t noticed the collapse, with cod still readily available at restaurants and markets because of foreign sources like Iceland and Norway. Scientists said late last year that the impact of climate change on Atlantic cod might be worse than previously thought. Fishermen pursue the fish in the Gulf of Maine and, farther off New England, the shallows of Georges Bank, both of which have experienced dramatic temperature rise. Around 2004, the gulf began warming about 10 times faster than previously. “This is what global warming looks like in the Gulf of Maine,” said Andrew Pershing, a Maine-based marine scientist who co-authored the paper last year in the journal Science. Goethel, also a marine scientist and a former member of a regional regulatory board, doesn’t bemoan the ocean’s changing temperature as much as the rules he must play by. Because of the tight quotas, he must avoid fishing around areas where cod live, he said. That is because cod are a “choke species,” and when fishermen reach their quota for cod they aren’t allowed to pursue other fish. Like others in the cod fishery, Goethel has had to adapt, but at his core he remains a cod fisherman. The experience has left him frustrated and more than a little bitter. For the most recent fishing year, he was allotted 3,600 pounds of cod. He caught his allotment of 60,000 pounds in 2010, and leased and caught an additional 50,000. He believes that the cod have moved and not died off, and that he could easily continue catching high totals without strict regulations. Scientists have said warming waters have indeed motivated some young cod to seek deeper, colder waters — some of which are closed to fishing. The cuts to catch limits represented the first and biggest blow to the industry, and they stemmed from overfishing and subsequent regulations designed to stop fishermen from taking too much from the sea. They were meant to preserve the fishery for future generations, and it made earning a living difficult. Climate change has only exacerbated that trouble. Other obstacles, such as the government-imposed cost of on-board monitors to collect data to inform future fishing quotas, have rankled Goethel, whose lawsuit seeking to block the charges is pending. But he perseveres. The changes have been difficult emotionally for Goethel, whose sons, Daniel and Eric, are a fisheries biologist and a tugboat captain. He instilled a love of fishing in everyone in his family, and old traditions are hard to part with. Michael Mohr harvested surf clams for almost 30 of his 55 years, and his desire to stay in the only business he has ever known now takes him far from his family. The clams he caught for decades feed tourists and locals alike in towns all along the coast. Now, those clams, which he once caught off New Jersey, are found northward or farther out to sea. Mohr has also moved on. About 10 years ago, he started commuting six hours each way from his home in Mays Landing, New Jersey, to the former whaling port of New Bedford, Massachusetts. He has also switched clam species; he got his start fishing for Atlantic surf clams but now pursues the ocean quahog. The quahog is well known to New England diners as a stuffed clam or in its own kind of chowder. Both quahogs and surf clams populate supermarket seafood sections. The reason for Mohr’s decision has been documented by published science, as well as on the decks of the boat he fishes from, the ESS Pursuit. Moving north for quahogs was a way to remain a clammer. Mohr leaves behind his wife of 20 years and makes the drive to New Bedford so he and his 29-year-old son, Danny, can spend 20 days out of 30 aboard the Pursuit. Mohr has two other adult children who live in New Jersey. He has missed his children’s first days at school, their sports events, and weddings of loved ones while out chasing clams, and, later, quahogs. Missing out on family life is worse these days because of his long commute on Interstate 95. Whether Mohr can make holidays like Thanksgiving is “hit-and-miss,” said his wife, Melanie. Mohr’s migration story is common in the clamming business, said Dave Wallace, a Maryland-based consultant in the industry. It was once based largely off Atlantic City, near Mohr’s home, but has shifted northward along with the clams, he said. Some fishermen have decided to instead pursue quahogs, as Mohr has, while others now travel farther out to sea to harvest surf clams. The surf clam fishery has slipped somewhat in the face of the changes, with a little less than 41 million pounds caught in 2014, the second-lowest total since 1980. Mohr is undaunted. Clamming has been good to him, and if he has to spend more time on the road as he nears 60, so be it. Associated Press videographers Kathy Matheson in Mays Landing, New Jersey, and Bonny Ghosh in Branford, Connecticut, contributed to this report. Follow Patrick Whittle on Twitter at http://twitter.com/pxwhittle . His work can be found at http://bigstory.ap.org/journalist/patrick-whittle .